Have you ever seen a $1.2 million, 105-speed recumbent bicycle with satellite data link, GPS navigation, ham radio station, cellular phone with fax and high-speed modem, active helmet cooling, heads-up display, speech synthesis and recognition, handlebar keyboard, head mouse, security system, hydraulic brakes, solar power, and a complete network of computers including SPARC, Mac, DOS, and FORTH systems? Well, now you can. After 17,000 pedaling miles aboard BEHEMOTH and its predecessor (the Winnebiko), high-tech nomad Steve Roberts, director of Nomadic Research Labs, will be the special guest speaker at a talk to be co-sponsored by the Computer Science Department and the Sierra Nevada Chapter of the Association for Computing Machinery. Roberts and BEHEMOTH represent a spirited blend of art and engineering, work and play, high tech and raw adventure. This unique machine is the product of 4 years’ work… aided by some 35 volunteers and 150 corporate sponsors. It has been featured in countless magazine/newspaper articles and on radio and television in the US and abroad. 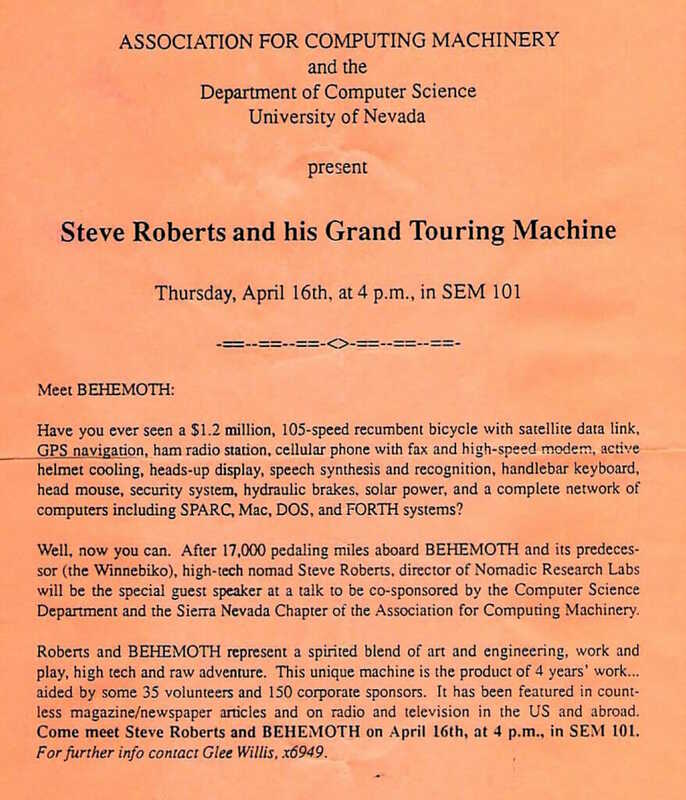 Come meet Steve Roberts and BEHEMOTH on April 16th, at 4 p.m., in SEM 101. For further info contact Glee Willis. See related local media coverage.